What about you, me dear? Do you want some happy-happy? But what did the rest of the DWC team think? Let’s find out, shall we? Having seen who had written this week’s episode, I will admit to being a little cautious. I was not a fan of Frank Cottrell-Boyce’s previous contribution to the Doctor Who universe and I was worried that we would get a similarly disjointed (in my opinion) story. I am so glad to say that I was proven wrong and left pleasantly surprised. The story itself felt like The Ark in Space; mixing in familiar tropes seen in new Doctor Who with the scale of the threat builds only for it to dissipate when the true nature of what has been going on is revealed. The story wasn’t trying to achieve too much this early on in the series which, the last few series have often done and made the whole series feel like we’re rushing to get to another part of the story without proper grounding. 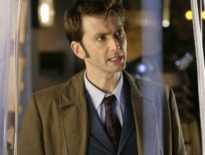 As in The Pilot there is a layer of intrigue about the Doctor and his promise to remain on Earth and protect the vault, but it isn’t forced down our throats as some previous plots have done. It was just a romp with a positive outcome. Also, after a bit of an iffy start for me, I am loving Bill and her questions that feels less like the companion being there to make the Doctor look clever. Her questions are funny and the rapport between her and the Doctor reminds me of that between Nine and Rose in Series One. This episode left me with a smile on my face. A genuine one. Truly a maniacal force of evil, this one is. Doctor Who hasn’t been as fun as this for quite some time. Dare I say it, it’s enough to put a smile on my face. Gah. Pairing Frank Cottrell Boyce’s lurid imagination with a sun-drenched labyrinthine brings us all the aesthetics and philosophy we could hope for, along with a very British take on emotional intelligence: the expression of emotion as a source of vulnerability. The episode’s monsters, emoji-robots – cute yet lethal – got more than a few laughs from this viewer. The delicious tease of Thin Ice at the end of Smile also very effectively invokes The Brink of Disaster‘s tease of Marco Polo. Saturday can’t return soon enough. I am going to run out of hats to eat because I expected middling mediocrity from this season and it’s now hit us with two good episodes. Capaldi is giving his best performance since he became the Doctor. 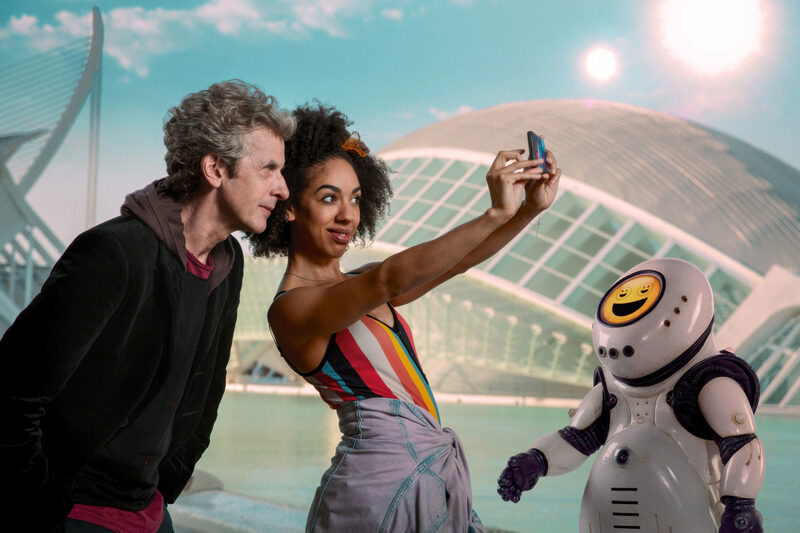 Pearl Mackie is superb: Bill is a real human being, beautifully played and totally convincing. She and Capaldi make a much better double act than he did with Clara. 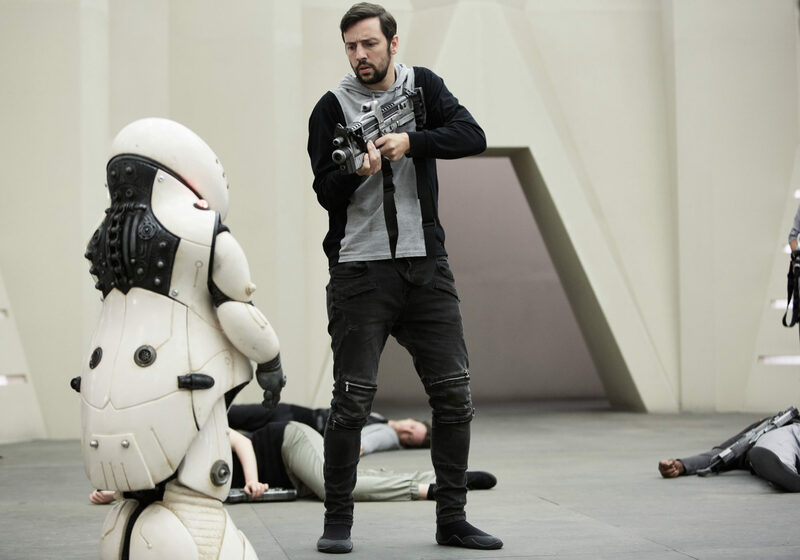 Well written, intelligently told, funny without being stupid, and I want one of those robots. In a box. On my doorstep. Delivered now. 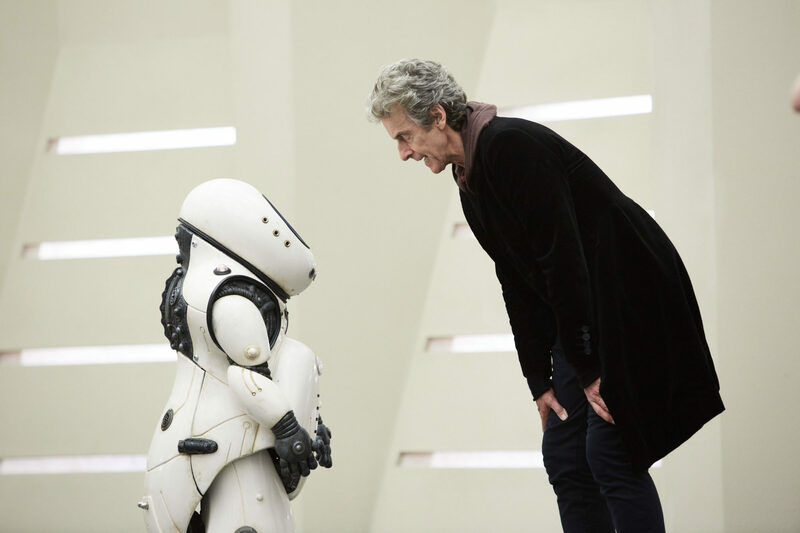 How much more likeable is the Twelfth Doctor now that he has Bill as his companion? A lot. Whether or not it is because of the companion change or not, Peter Capaldi’s Doctor has greatly softened and now actually seems to be enjoying his adventures! (It almost makes a person wonder if Clara should have left earlier?) 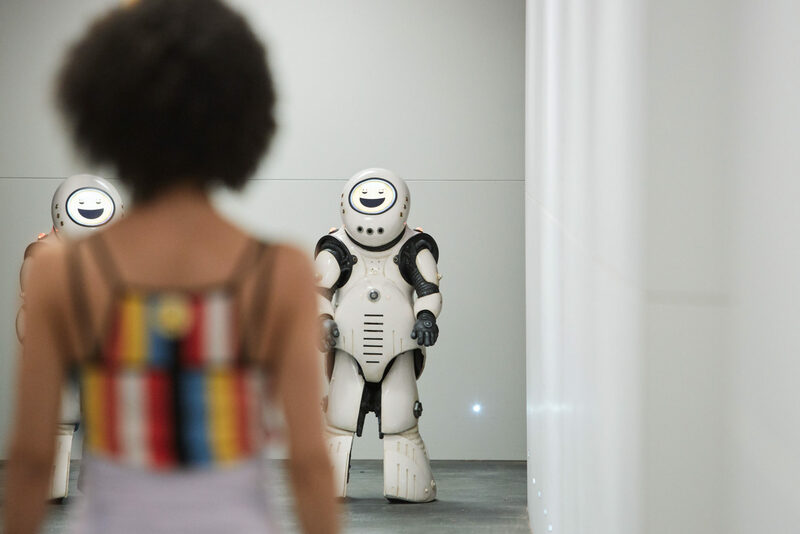 Getting back to this week’s episode, Smile was a solid second episode, not only for Pearl Mackie, but also for writer Frank Cottrell-Boyce, who made up for the woeful In the Forest of the Night. Overall, Smile gets a smile and a thumbs-up from me! The main thing I liked about Smile was that Capaldi and Mackie were once again great together. Their chemistry is fantastic. The relationship is less Educating Rita than The Pilot suggested it would be and more like two new friends who are excited about having found each other. More Baker and Sladen than McCoy and Aldred, then. I also liked that this episode was bursting with ideas. I think one criticism that could be laid at Smile‘s door was that some of those ideas were given short shrift. However, as someone who prefers The Web Planet to Genesis of the Daleks, I rather like stories whose reach exceeds their grasp and so I was a happy bunny. Overall, I’m pleased with the way that this new season of Doctor Who is shaping up and I’m excited about the next episode, Thin Ice. I liked Smile. 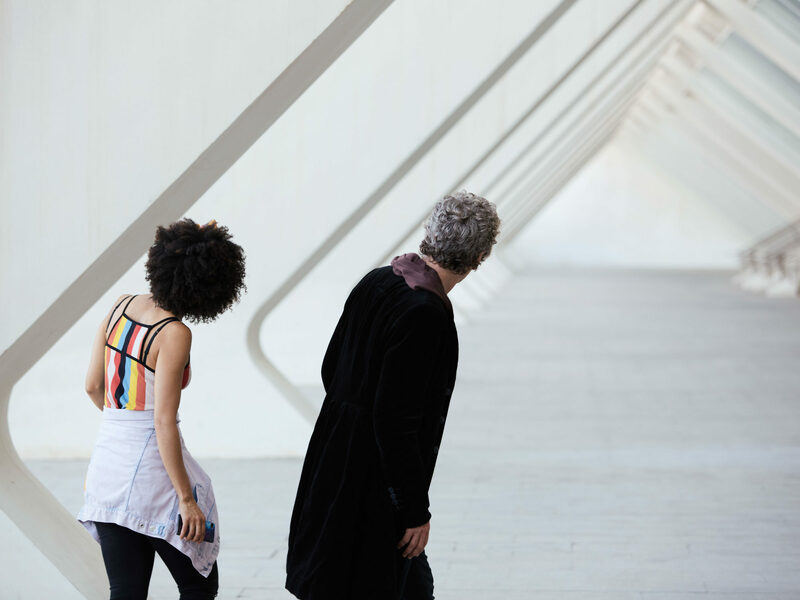 It was clever, beautiful to look at, and continued to showcase the wonderful Pearl Mackie and the best version of Capaldi’s Doctor that we’ve seen so far. This was far more traditional as a Who story than Cottrell Boyce’s world-swamping offering in Series 8 and he seems to have benefitted from it. The emojibots were a fantastic monster if perhaps under-used as a malevolent presence. My main gripe was the very sudden and slightly bizarre readiness of the woken colonists to regard their supposedly automatic preparation-systems as a military-style threat. Similarly, I felt that the Vardy’s perception of grief as both an incurable (otherwise kill the afflicted) and contagious (otherwise why kill the afflicted) disease needed a tinge more explanation to tick the sci-fi box. But these are probably artefacts of the pacy-45-minute format and were worth putting up with. Some science, some great CGI, some really odd pacing in a story that seems unable to decide if it’s just about the Doctor and Bill or needs a wider cast. In this case, the human colonists on this brave new world failed to make any real impression and the whole is a missed opportunity. On the plus side, Bill has a good measure of awe and questioning, not afraid to ask simple things like “How much did this cost?” And yet another story where the whole human race is in one place about to be wiped out. Yawn. “Happiness Will Prevail”. That’s what I kept expecting to hear the emojibots say if they actually said something. Early on this story reminded me an awful lot of the McCoy story The Happiness Patrol. If they painted the TARDIS pink, I would have lost it. Anyway, I loved this story. It had a nice look – the real life building in Valencia Spain had a distinct shape that I thought worked well in this story for what it was supposed to be; humans escaping Earth. The line where the Doctor says “Humans vacated the planet on all kinds of ships” is a nice way to keep the old stories The Ark and The Ark in Space from being blown up with new continuity. Most of this episode was just the Doctor and Bill exploring, which is something the old show did more than the new show. I like it. The resolution of the story did make me wonder if the Doctor could have arrived at what happened sooner than it did. Minor quibble though. Loved the story. 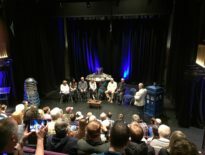 The last time Frank Cottrell-Boyce wrote for Doctor Who, he produced something that – for better or worse – was unlike almost anything that had preceded it. In Smile, the references come thick and fast: The Happiness Patrol-esque drive for shallow optimism; the Vardy’s childlike misunderstanding, echoing the nanogenes in The Doctor Dances, only with the appetite of the Vashta Nerada; the Seeds of Doom bit… I could go on. Had Cottrell-Boyce delivered 45 minutes of tropes and no substance, I’d be glowering, but there’s plenty of meat on the bone (which is more than you can say for many of the colonists). With the help of some thoughtful dialogue, and a narrative sparsity that mirrors the vast, almost minimalist surroundings, the episode’s real joy is the chemistry between its two leads, an ostensibly chalk and cheese pairing that is showing real promise. There’s nothing wrong with homage when it works, and Smile does. Yes! I must say that this series seems to have hit its stride right from the get go. While last week’s episode was reminiscent of Rose in its setup of characters for a new audience, this week reminded me of Series 2 opener, New Earth, with its far future of humanity setting with trappings of The Happiness Patrol‘s enforced happiness. I also got to thinking, “How many times has the Doctor encountered the last survivors of humanity?” That aside, I rather enjoyed the emojibots getting a bit carried away with their mission. This is proper Doctor Who! 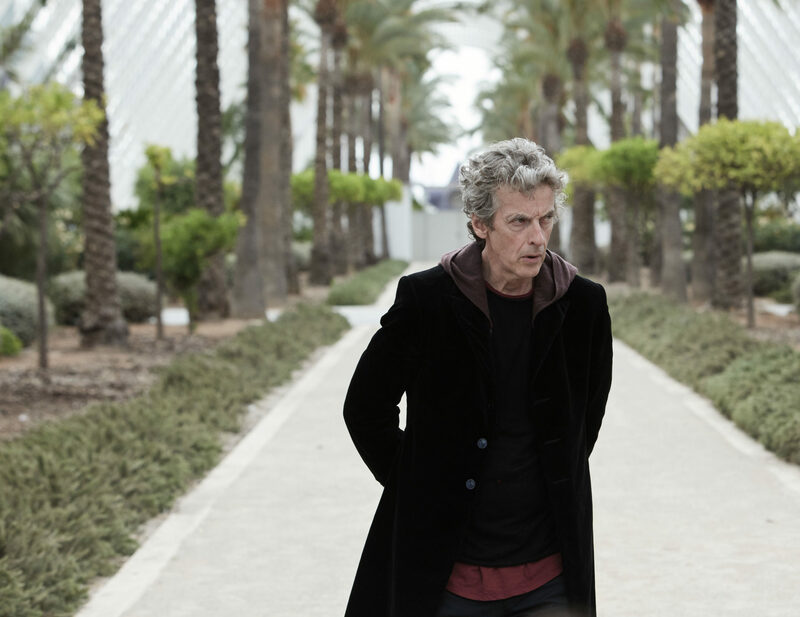 If this standard is maintained, we can look forward to Capaldi bowing out of Doctor Who on a high. As a fan of In the Forest of the Night, I was looking forward to Boyce’s return. Smile was completely different, of course, and I loved it for that. It’s an odd beast, however. A second character piece in a row; a slower pace; the Doctor taking far too long to realise what’s happening; and a minimal guest cast, including the woefully underused Mina Anwar. Smile should’ve been rubbish, but it wasn’t, was it? It was actually really, really good. Why? It’s tough to pinpoint, but I’m going to take a stab at it anyway. Doctor Who is full of joy and wonder again! It’s Doctor Who again! And doesn’t that just feel like the best thing of all…? Another well-received story! That’s two in a row. Let’s hope Thin Ice lives up to it, and judging from advanced reviews, it maintains the series’ quality. So what did you think of Smile? Should Frank Cottrell-Boyce be welcomed back soon?